When staged in London in 2002, this play was identified by The London Evening Standard, as “the first true play of the 21stcentury." As its five scenes unfold, the audience is immersed in a depth of bio-socio-medical-ethical questions to ponder. This puzzler of a psychological thriller heads straight into the middle of the situation when, after having seen something unnerving, Bernard, a son questions Salter, the father who has raised him. "Are you my father? Was I the first one, the original? Would you know me in the batch?” The father answers somewhat evasively, often changing his story, finally telling Bernard, “I am your father (long pause) genetically.” At this point in the first scene, the audience, if not already confused, realizes it has no idea what is going on. Why does Bernard ask if he was the first of ‘a number’? Who are the “they” whom Salter wants to sue for a huge amount of money? Caryl Churchill’s intriguingly styled script allows for a great deal of free rein of which director Byam Stevens thoughtfully takes full advantage. In a discussion with opening day audience, he would not categorize the play for all of the many questions which it poses. The script has no stage directions and little punctuation. Learning this, its audience realizes what imaginative command both Stevens and his truly brilliant actors have staged to create amazing characterizations. 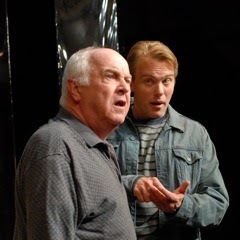 The versatile Jay Stratton returns to Chester as Bernards 1 and 2, and Michael Black, three of the identical sons who are not at all similar in behavior nor demeanor; this is most impressive acting. As Salter, Larry John Meyers is a brilliant choice in his first appearance at Chester. He adeptly changes in his behavior as each of the young men confront him. Audience members must watch carefully during the scene changes; that there are no black-outs is another clever directorial decision. Both actors speak with a gentle, easily understood British accent, while standing or sitting across from one another in unmatched kitchen chairs on an otherwise bare platform stage encircled with 19 slightly out of focus, varyingly angled mirrors.